As a follow-up to the feature on building your first flying scale model, I though it might be fun, and even possibly educational, to do an article called “build your first flying scale jet”. I do not intend to duplicate any of the basic information from the Comper Swift article, but rather will cover in detail any new and different techniques that I use, and of course spend some time on the trimming process, which is somewhat different to that of a rubber model. I gave a lot of thought to choosing a suitable subject, one which would make a stable model, yet be relatively simple to build, and I also wanted one that had not been modelled for Rapier power before. Eventually the decision fell on the Republic F-84F Thunderstreak, an attractive aircraft with almost ideal proportions for a scale jet and plenty of wing area. In addition there are many colourful paint schemes that can be applied to it. Just to give you a bit of confidence in the design, two have been built so far by brave pioneers and flown successfully, and Steve Bage has also built one converted to the RF-84 “Thunderflash” variant, which flew very well straight off the board. Steve has kindly sent me the drawings showing his changes, which you can download with the F-84F plan. The Thunderflash will be slightly more complicated to build, because of the wing mounted air intakes, but it makes a very attractive model. As with the Comper Swift article, I will show the build warts and all as I go, and any mistakes I make can be shared by everyone! The pdf files should print off at exactly full size if you set your printer to A4 paper. This should work even if you do not have A4 paper in the printer, as the margins have been left deliberately large. Every plan has a scale drawn on it in the form of a row of inverted T shapes. These are spaced exactly 50 mm apart, and should help with the sizing. 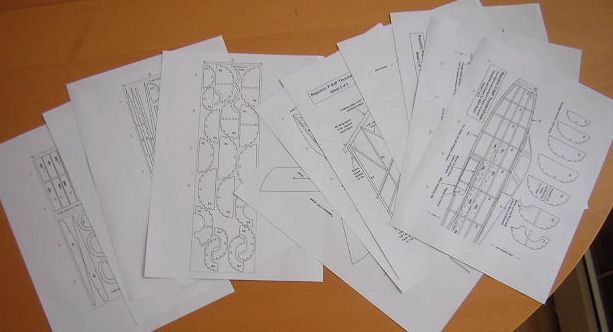 Once you have printed the plan sheets off, we can start work. The chapters linked below will detail the various stages of building, and will increase in number as construction progresses.